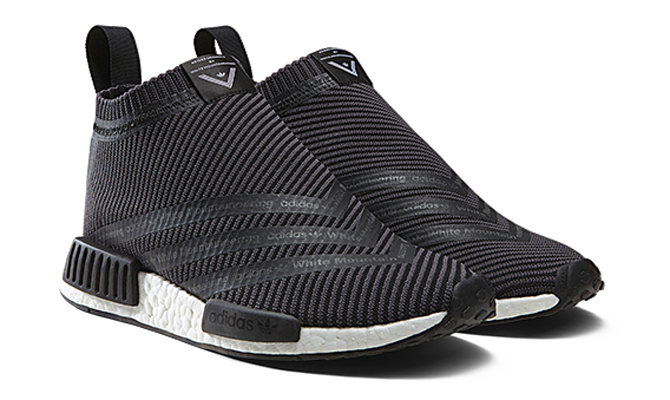 White Mountaineering remakes the NMD CS. It appears that collaborative versions of the adidas NMD are going to keep on coming. Following up on Nice Kicks and Pharrell's respective remixes of the running silhouette, Japanese imprint White Mountaineering has remade the NMD City Sock. Its take outfits the shoe with a new look involving sets of three stripes that meet at the middle of the shoe for a chevron effect. Those stripes feature branding calling out both adidas and White Mountaineering. The latest White Mountaineering x adidas capsule, including the NMD pictured, is currently scheduled to release on Oct. 16. Also included in the group on the footwear side are EQT retros and some chunky trail shoes.